Susan Boyle was beaten in the public vote by Diversity, a street dance group from Essex. Though Susan came in second, she is still a "winner" and definitely, she has a glittering singing career ahead of her if she likes to be one. Jones Salk is an American medical researcher and virologist, best known for his discovery and development of the first safe and effective polio vaccine. The below article by Dr Wong Wee Nam talks about we shouldn't be too panicky on H1N1 flu virus. Dr Wong also made references to a 13th May 2009 Straits Times article “Let it in while benign to develop herd immunity” by Dr Lee Wei Ling. For your information, Dr Lee Wei Ling is the daughter of Singapore's Minister Mentor Lee Kwan Yew. Both Dr Wong and Dr Lee talk on herd immunity. Since H1N1 is not as lethal as originally thought and it is impossible to prevent the virus from entering Singapore, they feel Singapore should welcome the invasion of H1N1 so that our people can develop herd immunity from it. One door close means one door open. but he promise to be faithful. I hope my sincerity, determination and commitment can change things. Google new ambitious project Google Wave, is set to rework email, instant messaging, document sharing, and blogging. It will be available by end of 2009. My first semester exam results for my Master of Computing at National University of Singapore (NUS) is out. I got A- for CS5251 - Integration of IS and Business and a B+ for CS5259 - Information Technology Outsourcing. I hope to share my good news with her. FINANCIAL theory suggests that assets with higher risks should reward investors with higher returns. But that, sadly, is not the case in reality, whether one looks at the US or the Singapore market. Concern over how retail investors are to accumulate assets for retirement, particularly in the wake of deep losses since mid-2008, has prompted one fund management firm to design an approach that it says is efficient, as well as relatively rewarding, for individuals. DBS Asset Management believes the key is to take volatility as a starting point when it comes to screening for stocks, and not returns. So far, it has tested its 'volatility managed' (VM) approach on a number of indices with what seems to be gratifying results. VM is a more concentrated portfolio, pre-selecting stocks based on favourable risk characteristics. Bear in mind, of course, that these are back-tested results and the past is no indication of the future. On the STI, for instance, the VMSTI generated 85 per cent greater returns and 15-20 per cent lower risks, compared to the STI alone. The results are for an 18-year period between 1991 and 2008. A VM overlay on the Hang Seng Index had a similar outcome. Over the period, returns were higher by 185 per cent, and risks lower by 18 per cent. Ditto for using VM on the MSCI World - returns were higher and risks lower. First, some background. DBS Asset Management is the only homegrown asset manager to launch and manage exchange traded funds here. To date, it manages two ETFs - the DBS Singapore STI and the ABF Singapore Bond Index fund which invests mainly in Singapore government securities. The latter has just been included in the CPF Investment Scheme. The gestation of the VM approach lies in the conviction that there was more to some basic investment principles than most may think. One example is compounding. Investors are routinely taught the power of positive compounding through time, but few may have woken up to the harsh reality of negative compounding. That is, an asset which has suffered a fall in value, will need to rise by a much greater percentage than the magnitude of its fall just to get back to its original value. Hence an asset that has fallen 50 per cent will need to double to get back to par. In terms of risk and reward, evidence from the US and Singapore markets show that high-risk stocks tend to generate lower returns and vice versa. For the Singapore market, in fact, the slope of the line which plots securities' returns per unit of risk between 1999 and 2008 is fairly flat. Its message is clear: You are not compensated for taking on risk. 'You have to be very careful when you pick stocks. The return to risk ratio is lower than people think . . . Our idea is to manage risk. Because of compounding, risk may work against you in the long run, so you have to manage the risk,' says Mr Hsien. The trick appears to be to sift out risk that is not compensated. There are two types of risks that stocks exhibit, as the firm finds in its analysis. One is with respect to the market; the other is 'idiosyncratic' or specific to the stock. It is the latter that is expected to serve a portfolio well in terms of diversification. 'Diversification only works with idiosyncrasy. In a bull market, things are well correlated. But in a down market, they are forced to be correlated by things you had not thought about. This takes us to the screen that the firm uses on the STI component stocks, based on nine risk factors, statistical in nature. The stocks are ranked, and the top 15 are chosen for the VM portfolio. These include SPH, SingTel, ST Engineering, F&N and ComfortDelgro. So far, the results appear mixed. In terms of standard deviation and downside deviation, the VMSTI exhibits lower risk, but returns have suffered relative to the STI. The time period, however, is short - the current year to early May. DBSAM, however, is confident in the VMSTI's long-term potential. It has now incorporated the VMSTI into a fund - the Horizon Singapore Equity Fund, where 30 per cent of the fund is invested according to VMSTI, and 70 per cent in the index tracker. The fund has $23.6 million in assets, and charges a 1.25 per cent management fee. The 70 per cent allocation to the index is in line with what active managers do. 'It's impossible to be 100 per cent active, the volatility swing would be too high. Over any period of time, you'd end up with 70 per cent exposure to the benchmark . . . We're highly confident that our expenses will be lower, and investors will have a better outcome. We want to prove that and get a track record for this. We think this will work,' says Mr Hsien. Such a strategy is of course difficult for individuals to execute on their own. But they can still benefit by having a larger allocation of their core holdings in a low-cost STI ETF, rather than an active fund that largely hugs the benchmark anyway. The ETF has a management fee of just 20 basis points a year. Exam results for my first semester will be released on 29 May 2009 12:00pm. Pass my Project Management Professional (PMP) certification exam by July. Reinforce my .NET 3.5 skill to prepare myself for .NET 4.0 certification next year. Accelerate my Master programme by taking 3 modules next semester. North Korea defied the world by launching its second nuclear test. This nuclear test recorded a scale of 4.5 on the Richter Scale. Russia's defence ministry estimated a blast of up to 20 kilotons that is comparable to the American bombs that flattened Hiroshima and Nagasaki in 1945. I am selling 32gb iPod Touch at the price of S$500. U.S. President Obama passed a new law - the Credit Card Accountability, Responsibility and Disclosure (CARD) Act of 2009. This law will benefit consumers who have seen interest rates raised on balances, payment due dates manipulated at short period of time, and charged high fees for paying a bill by phone or online. It is estimated to cost credit card issuers US$10 billion in total lost interest for this new law. I think it is time to terminate unnecessary credit cards before they stop waiving off annual fees. The Kübler-Ross model describes in five discrete stages a process by which people basically have to go through when dealing with grief and tragedy, especially when diagnosed with a terminal illness or catastrophic loss. In my opinion, it is also applicable in a relationship breakdown (catastrophic loss). I am in stage 2 to 5, all at the same time. Wolfram|Alpha is a computational knowledge engine being developed by Wolfram Research. The project was announced in March 2009 by Stephen Wolfram. Wolfram|Alpha will officially launch May 18, 2009 as "one simple input field that gives access to huge system, with trillions of pieces of curated data and millions of lines of algorithms." Its mission is "To make all computable, factual knowledge available to everyone". I think Wolfram|Alpha is going to be a serious contender to Google search engine. How should I use my 29.5 days of annual leave? After cancelling all my planned annual leaves and adding what I am entitled to for year 2009, I will have a total of 29.5 days of annual leave. How should I use my 29.5 days of annual leave? They look to be quite meaningless now. Ever heard of Life Continuity Plan (LCP)? LCP is a term defined by myself. Like in any businesses, the need to have a business continuity / disaster recovery (BC/DR) plan in place is essential to ensure critical business processes can still function in times of unexpected events or disasters. Singapore is the first country in the world to introduce a Standard and Certification programme for BC/DR service providers. With such certification, it provides confidence to clients when tapping onto the expertise of such certified service providers. In life, I believe to a certain extent, one needs to have such a similar strategy in place for survival in this very unpredictable world. Everything or/and anything can just happen any time and once impact is felt, the impact can be irreversible. That's when LCP is activated. Identified risks defined earlier during the risk mitigation stage are assessed using methods like balanced scorecard. By definition, risk is defined as the factor between probability and impact. If both probability and impact are high, risk will be high. When risk is high, we will need to decide if it is worth taking the risk. Life is all about emotions whereby people tend to be more subjective rather than objective. Some may argue LCP can be too scientific and may not be applicable and realistic. So, is life an art or a science? There won't be any updates on this blog for now because of a storm. Ironically, it coincides with the current Sumatra squall season. I am keeping all of my fingers crossed and intertwined, hoping for the best. I know the outcome is non guaranteed but I know the need to fight for it. I hope my intended THE audience will read this entry. 我问天,我问天. I must first clarify my position. I am neither a PAP supporter nor a supporter of any opposition party. Jemaah Islamiyah (JI) detainee Mas Selamat bin Kastari escaped from the Whitley Road Detention Centre at 4:05 pm on 27 Feb 2008. Mas Selamat was the leader of the Singapore JI network. 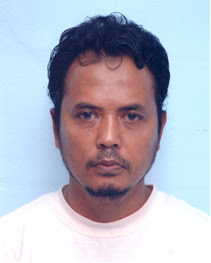 Today, The Straits Times, later further confirmed by the Singapore government, announced that Mas Selamat is captured. MSK was found in Johor and is currently under detention by the Malaysian authorities in Johor Bahru (JB). We should give credit to all, directly or indirectly, involved in the re-capture operation. When someone of such a high profile escaped from a detention centre, he must already had had an escape plan. In fact, Mas Selamat used an improvised flotation device to escape from the north shore of S’pore to Johor. The efforts by the Singapore government to re-capture the fugitive can be seen by more stringent checks along the Singapore borders. I do not believe in 100% no-failure guard against his escape. The fact that Mas Selamat is re-captured by the Malaysians does not mean that Singaporeans are incompetent. Once a fugitive is in a foreign land, to re-capture him by the local authorities will be harder. It is analogous to like one is harder to get found out if he is not hiding in your house. DPM Wong Kan Seng speech in ISD Service Promotion Ceremony on April 15 clearly shows DPM Wong was unaware of Mas Selamat capture. The Johorians silence on the capture is understandable. Mas Selamat is a key JI leader and is important to the Malaysians themselves for their intelligence gathering. We, as Singaporeans, should rejoice for Mas Selamat re-capture and not pointing fingers on whose heads must roll. I feel many articles and forum replies on the internet are biased against the PAP. Changi Detention Centre security lapses, which led to Mas Selamat's earlier escape, were identified. Nine prison guards and ISD officials, including the commander of the Whitley Road Detention Centre and his superior, were either sacked or demoted. The Singapore government had admitted the mistake. Let's be objective in dealing this matter and give credit when credit is due. FUND managers have been steadily putting their money back into Asian equities, helping to ignite a rally in regional stock markets in the process. The influx of new money - in the wake of subsiding redemptions - started as early as the end of last year. It was interrupted by massive redemptions when sentiment soured in March but investors resumed their buying last month to fuel a rally that has lasted eight weeks - the longest winning streak in more than a year. The local benchmark Straits Times Index (STI) has risen 42.4 per cent from its March low and is up 17.8 per cent since the start of the year. Markets in Hong Kong and Shanghai are up 27.3 per cent and 41 per cent, respectively, since January. The improved investor sentiment is due to 'the tentative early signs of stabilisation in the economic data', said Mr Andrew Hua, director for investment and strategy at Deutsche Bank Private Wealth Management. In mid-March, the private wealth management arm became a little less defensive and shifted some of its cash into shares, he said. 'Although most statistics are still showing weakness or negative growth, the pace of decline has somewhat lessened,' added Mr Hua. Foreign funds invested about US$224 million (S$329 million) in Asia ex-Japan regional funds in March, according to data compiled by EPFR Global. This surged to over US$920 million last month. Fund managers say it was a combination of short-covering and funds with long positions investing spare cash in the market. They also said the very low yields on cash and bonds made equities a more attractive investment. Cash weights at Asian funds are as low as the levels seen prior to Lehman Brothers' bankruptcy, said Citigroup strategist Elaine Chu. Generally, Asian funds have been overweight on China, Hong Kong, Singapore and Thailand, while underweight on India, Taiwan and South Korea. Mr David Lee, managing director of Ferrell Asset Management, a Singapore- based hedge fund, said he started to put in money in January and February. 'It was the best time to increase Asian allocation in risky assets such as property. Sentiment was very bearish; valuations of some stocks became very attractive,' he said. But fund managers are turning cautious again in the face of the recent run-up in stock prices, saying that a correction may be on the cards. 'Capital inflow may still continue but not in such a rapid way that we've seen,' said Ferrell's Mr Lee. This is because funds may have accumulated their positions and have enough cash in equities. 'While the worst of redemptions may be over, there should be some pullback along the way. A bottom has been reached but it does not mean there will not be a correction,' said Mr Lee. But she added that there could be further liquidity flowing into Asia when global funds start to turn bullish on it. Today marks the end of my last paper for my first semester as a Master student. One of the most challenging part is to get myself accustomed as a part-time student holding a full-time day job. It is made more challenging after having left school for more than 3 years. I almost forgotten seeing myself writing or scribbling continuously for 2 hours in an examination hall. The Windows 7 RC will be available at least through July 2009 and there's no limit on the number of product keys. That's according to Microsoft. So there's no rush to download the RC. The RC will expire on June 1, 2010. INVESTORS were rubbing their eyes in disbelief yesterday after shares rallied with the kind of gusto that many thought was a thing of the past. The benchmark Straits Times Index rocketed 108.43 points - 5 per cent - to 2,028.71, its highest since Oct 15 last year when global markets were in free fall. Volumes were also charged, with 2.8 billion shares worth $2.3 billion changing hands. One dealer had been expecting the local market to be subdued after the long weekend, with investors waiting for the results of the stress tests for United States banks due on Thursday. But investors defied the game plan and latched on to signs of improving economic conditions. Retail investors and fund managers flooded the market to buy stocks, igniting a mini boom in such shares as SembCorp Marine and Keppel Corp.
SembCorp Marine rose 33 cents to $2.44 on a volume of 18.9 million shares. The volume was nearly double the average daily volume seen over the past year. Lots of 20,000 to 50,000 shares were being done, indicating that fund managers were buying. 'Valuations are still low and Asia seems to be recovering,' said one dealer. Fund managers are also worried about missing out on the market's recovery, which could lead them to underperform based on the index. Keppel Corp rose 4.7 per cent to $6.26 on a heavy volume of 16 million shares. Cosco Singapore gained 7.8 per cent to close at $1.10, gaining eight cents on a volume of 53.2 million shares. Owner and operator of coal mines Straits Asia rose 10 cents to close at $1.16 with 43.8 million shares traded. The stocks were likely driven by hopes that the economic recovery would spur demand for commodities and shipping. The buoyant mood left many shares at year highs, if not their highest since October last year. SembCorp Marine's price was the highest since Oct 3 when it hit $2.75, while parent SembCorp Industries closed at $2.87 yesterday, its highest since October. The local banks also fared well. DBS was $1 higher at $10.50 with 21.6 million shares traded, its best finish since October. United Overseas Bank was $1.30 up at $12.80, its strongest performance since Jan 8, while OCBC surged 10 per cent to $6.47 on a volume of 23.7 million shares. This was its highest price since October. Property counters also had a bounce, with CapitaLand finishing 21 cents stronger at $2.97 on a volume of 40.7 million shares. City Developments rose 82 cents to $7.30 with 8.1 million shares traded. Golden Agri-Resources, a palm-oil giant, outshone itself with 233.1 million shares traded. It rose four cents to 41 cents as palm oil prices rose to their highest in almost nine months. Other actives contributing to the high volume included PSC Corp, up 5.5 cents to 21 cents on a volume of 136 million shares. Overall, the STI is now up 15 per cent this year, a reasonable performance considering it had got off to a bright start in early January before steep falls. Still, some dealers are wary, considering how the index fell just below 1,500 points in March and has now jumped about 12 per cent since the middle of last week. Retail investors and fund managers flooded the market to buy stocks, igniting a mini-boom in such shares as SembCorp Marine and Keppel Corp.
SMRT said train frequency will be reduced by 30 per cent once Singapore's pandemic alert level hits red. This is because its service staff are divided into two teams to prevent the potential spread of the H1N1 virus. Wow! This is going to be causing lots of inconveniences to the public. Asian stocks advanced, lifting a regional benchmark index to a seven-month high, as manufacturing in China expanded for the first time in nine months and regional leaders pledged to start a foreign-currency reserve pool. Canadian pigs infected with H1N1 from human, so start culling human beings? Pigs in Canada were thought to be infected by a Canadian farm worker who recently visited Mexico and got sick after returning to Canada. Shall we start culling of human beings to stop H1N1 from spreading to the swine community? Former AWARE (Association for Woman's Action and Research) president, Ms Dana Lam, is now again the new president of AWARE. Ms Josie Lau and her team were forced to step down from office after a vote of no confidence was passed against the new Exco, with a margin of 1,414 votes to 761 votes. Ms Josie Lau was the president for less than two months. Josie Lau and team "seized" and voted out the Dana Lam's team less than two months back citing the AWARE was moving in the wrong direction. Josie Lau and team were mainly made up of newly enrolled members. Microsoft next operating systems, Windows 7, has just released Release Candidate (RC) 1 for download. It will be available at least through June 30, 2009, with no limits on the number of downloads or product keys available. Refer to http://technet.microsoft.com/en-us/evalcenter/dd353205.aspx for download information. Google and 47 other international corporations have been sued in a US District Court for trademark infringement over their use of the word "Android". Influenza A (H1N1), Cause for Alarm? Obama noted that officials are not certain that the H1N1 flu will be more severe than other seasonal flus that kill 36,000 people on average every year and cause about 200,000 hospitalizations. H1N1 may run its course like ordinary flus, he said, noting that the reason scientists are concerned is that this is a new strain. The 1957-1958 pandemic flu took 70,000 deaths above the normal flu season, and the 1968-1967 pandemic flu caused 33,000 more deaths than the average flu season. The "Spanish" influenza pandemic of 1918–1919, which caused ≈50 million deaths worldwide, remains an ominous warning to public health. Many questions about its origins, its unusual epidemiologic features, and the basis of its pathogenicity remain unanswered. The public health implications of the pandemic therefore remain in doubt even as we now grapple with the feared emergence of a pandemic caused by H5N1 or other virus. However, new information about the 1918 virus is emerging, for example, sequencing of the entire genome from archival autopsy tissues. But, the viral genome alone is unlikely to provide answers to some critical questions. Understanding the 1918 pandemic and its implications for future pandemics requires careful experimentation and in-depth historical analysis. Just hope no one will be infected with Influenza A (H1N1). I do not wish anyone, including myself, to be quarantined. That's a lot of inconveniences. U.S. third largest auto maker, Chrysler, finally filed for Chapter 11 bankruptcy after failing to meet requirements to avoid 30 days bankruptcy deadline on 30 April 2009. After consulting the Auto Task Force, Obama announced the very difficult decision for Chrysler to file for Chapter 11 bankruptcy and need for a major restructuring. For the past 1 week, Google Gmail Labs released 2 new lab features, the latest being including Google search results in email, and the other one on extra emoticons for emails. Personally, I do not find the including of Google search results in email of much use and so will not be making reviews on it. New feature on new extra emoticons is interesting. To enable the new feature, simply go to Labs under Settings, and then enable "Extra Emoji". 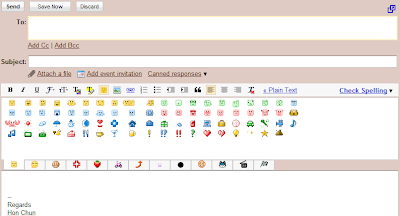 After enabling "Extra Emoji", you will see a full range of new emoticons to choose from when composing a new email. From 30 April 2009 onwards, World Health Organization (WHO) will refer to the new influenza virus as Influenza A(H1N1). It was originally known as Swine Flu. The rename is necessary after complaints that the original name was causing an unjustified clampdown on pork trade. Despite the name swine flu, no pigs are reported to be suffering from the disease, which also happen to have components from influenza strains afflicting people and birds in three continents. The renaming was also initiated by countries like the Jewish Israelis since pork is one of the many foods forbidden from consumption.